With California in the grips of drought, farmers throughout the state are using a mysterious and some say foolhardy tool for locating underground water: dowsers, or water witches. 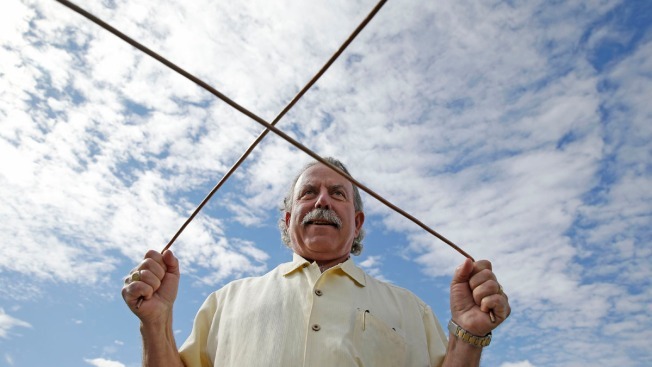 Practitioners of dowsing use rudimentary tools - usually copper sticks or wooden "divining rods" that resemble large wishbones - and what they describe as a natural energy to find water or minerals hidden deep underground. While both state and federal water scientists disapprove of dowsing, California "witchers" are busy as farmers seek to drill more groundwater wells due to the state's record drought that persists despite recent rain. The nation's fourth-largest wine maker, Bronco Wine Co., says it uses dowsers on its 40,000 acres of California vineyards, and dozens of smaller farmers and homeowners looking for wells on their property also pay for dowsers. Nationwide, the American Society of Dowsers, Inc. boasts dozens of local chapters, which meet annually at a conference. "It's kind of bizarre. Scientists don't believe in it, but I do and most of the farmers in the Valley do," said Marc Mondavi, a vineyard owner whose family has been growing grapes and making wine since the mid-20th century in the Napa Valley. Mondavi doesn't just believe in dowsing, he practices it. On a recent afternoon, standing in this family's Charles Krug vineyard holding two copper divining rods, Mondavi walked slowly forward through the dormant vines. After about 40 feet, the rods quickly crossed and Mondavi - a popular dowser in the world famous wine region- stopped. "This is the edge of our underground stream," he said during the demonstration. Mondavi said he was introduced to "witching" by the father of an old girlfriend, and realized he had a proclivity for the practice. After the valley's most popular dowser died in recent years, Mondavi has become the go-to water witch in Napa Valley. He charges about $500 per site visit, and more, if a well he discovers ends up pumping more than 50 gallons per minute. With more farmers relying on groundwater to irrigate crops, Mondavi's phone has been ringing often as growers worry about extended years of dryness. He had six witching jobs lined up over a recent weekend, three homes whose springs were running dry and three vineyards. It's so popular that he's even created a line of wines called "The Divining Rod" that will be sold nationwide this year. While popular, scientists say dowsers are often just lucky, looking for water in places where it's already known to likely exist. "There's no scientific basis to dowsing. If you want to go to a palm reader or a mentalist, then you're the same person who's going to go out and hire a dowser," said Tom Ballard, a hydrogeologist with Taber Consultants, a geological engineering firm based in West Sacramento. "The success is really an illusion. In most places you're going to be able to drill and find some water," he said. Still, the consistent interest in water witches nationwide even spurred The U.S. Geological Survey to officially weigh in on the fairly harmless practice. Dowsing has not held up well under scientific scrutiny, the USGS said, adding that dowsers are often successful in areas where groundwater is abundant. "The natural explanation of `successful' water dowsing is that in many areas water would be hard to miss. The dowser commonly implies that the spot indicated by the rod is the only one where water could be found, but this is not necessarily true," the survey said in its report. Christopher Bonds, senior engineering geologist for the state Department of Water Resources, said his agency does not advocate using witchers. "DWR is an advocate for having qualified and licensed water professionals locate groundwater resources using established scientific methods," Bonds said in an email. Don't tell that to John Franzia, co-owner of Bronco Wine Co., the nation's fourth-largest wine producer based on sales. It makes wine under hundreds of labels, including the famous "Two Buck Chuck." Bronco also owns more vineyard land in California than anyone else, and when it needs a new well there's a good chance a dowser will be employed. Franzia said the company uses many technologies to find water on its 40,000-acres, but turns to dowsers often and with great success. "I've used witchers for probably the last 15-to-20 years," Franzia said. "Seems like the witchers do the better job than the guys with all the electrical equipment. I believe in them." Associated Press reporter Terence Chea contributed to this report.